I am still recovering from my trip to Alaska so I will keep today’s blog nice and short. Short in length, but hopefully not in content. 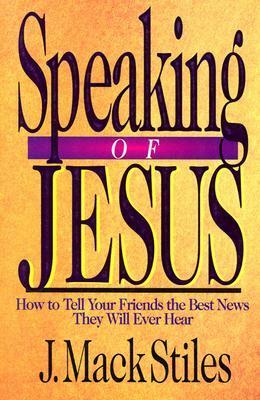 I’ve talked about evangelism before and my struggles with making this a regular part of my life and not waiting until I get to the mission field to start so Speaking of Jesus by J Mack Stiles was a natural fit for my current season in life. I liked the book, but often times found myself thinking that the book made it sound much easier than it really is. Even though Mack Stiles repeatedly said that it takes work to become comfortable with talking to people about Christ, I still kept thinking that he made it seem simple. I guess it is simple though. When you get an amazing present from someone is it hard to share with anyone and everyone that will listen? I know it’s not for me, I even have a hard time keeping to myself a great gift that I am going to give to someone. Why are we, and i am definitely including myself in this one, so slow to share what Jesus has done for us? I mean, seriously, can you get better than the gift He has given us, life eternal? How does your new video game system, piece of jewelry, trip or other temporary gift stack up? Don’t get me wrong, I still love presents, giving and receiving, but do they compare? If they don’t compare to the gift God has given us then why aren’t we will to share it with others? I want to highlight a few interesting things that Mack Stiles says in the book that I hope will pull on your heart as much as it has mine. God asks the same of us in evangelism. God wants us available to people, not shouting instructions at them. (They often can’t understand what we’re talking about at first, anyway.) He wants us to get into others’ lives. He may not ask us to steal a boat, but he may ask us to cross some conventional boundaries. If we are willing to risk our comfort to get into other people’s worlds with the truth we bear, we’ll be a more powerful witness than all the instruction manuals in the world. Availability-mental and physical is the first step of evangelism. Christians need to go physically and mentally into all the world: to Africa and non-Christian cubicles at work, to Congress and smoking sections of restaurants, even to Florida beaches. When we come to know the love of God, we want to share our faith. But here’s shocking news: our comfort has a very low biblical priority. Jesus doesn’t seem to care much about our comfort. I know I have been plugging my indiegogo project a lot on this blog and that’s because I want to get to Germany as fast as possible, but that is only possible if I have your help. Please check out the project and share it with your friends. Even if you can’t donate money, maybe someone you know can. Any help I get is greatly appreciated!